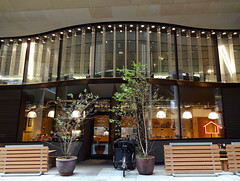 Japanese restaurant in the City, just off Cannon Street, specialising in udon. It's a sparsely-decorated space, with off-black tiles on the floor, wood-panelled walls, an abundance of exposed ducting up by the ceiling, and a long bar with low stools stretching the full length of the room. Blackboards hang on the walls, listing the specials of the day. In the semi-open kitchen behind the bar, staff rinse noodles and ladle out miso soup, while more elaborate cooking takes place further back past a curtain. Kake visited on a Tuesday lunchtime in October 2018. Although I was quite early for lunch, arriving a little after 11:30am, there were already half a dozen people in. More arrived while I was there, and by noon all the tables were taken and the bar stools were also nearly all full. Music was playing, only just audible over the sound of conversation. The udon menu is divided by temperature: you can have hot udon in hot broth, cold udon with hot broth, or cold udon with cold sauce to dip or pour. It was a chilly day, so I went for the first section, choosing buta kasu-miso (udon with pork in a broth made with miso and sake lees; £11.60) photo. It wasn't enormously exciting, but it was very good for what it was. The thinly-sliced pork was cooked just right, and had a nice creaminess to it; and the mound of spring onion greens on top went really well with the meat. The broth had just the right amount of both richness and saltiness. The noodles weren't starchy, and retained a slight bite without any hint of undercooking. A bottle of filtered chilled tap water was brought as I sat down, without me having to ask. Service in general was efficient without making me feel rushed. A 12.5% service charge was auto-added to the bill. Accessibility: No steps to get in. No steps to toilets, which consist of three decent-sized unisex cubicles including one (larger than the other two) marked as accessible. They prefer to seat solo diners at the bar, which by default means a backless stool, but on our visit they were happy to replace one of the stools with a proper chair. Last visited by Kake, October 2018. Opening hours taken from the Koya website, November 2018. Last edited 2019-01-20 11:07:06 (version 2; diff). List all versions. Page last edited 2019-01-20 11:07:06 (version 2).